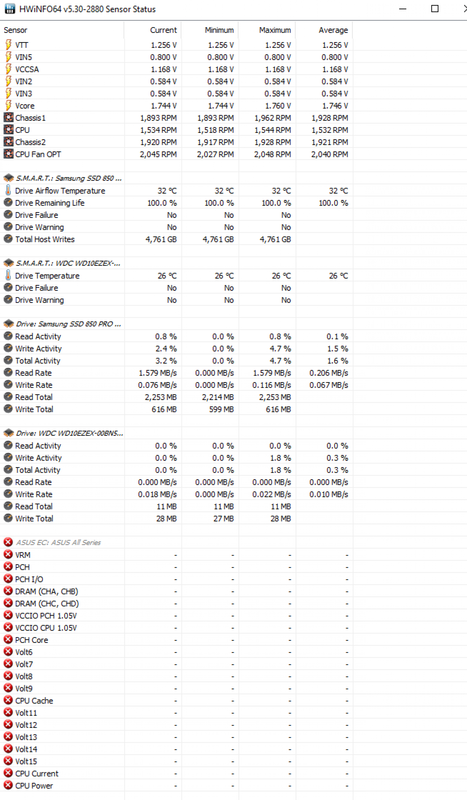 I own since one week the ASUS X99-Deluxe II and I can already see some issues wiith HWInfo reported values. 2/ What are all those red crosses ? Please, turn off sensor's VIN2/VIN3 and VIN5 - this logical sensor not used for real hardware sensor and hide ASUS EC used RMsClick. This is simple settings. Advanced support of ASUS X99-DELUXE II has been added in the latest HWiNFO32/64 beta v5.31, Build 2885. So please get that version first. Those red crosses mean that the sensor reading is disabled in HWiNFO. When you got a warning about possible issues when accessing this sensor you have probably chosen to disable it. You can easily enable it back again by right-clicking on the sensor title and choose "Enable monitoring". As for Vcore, it seems that the logic used by ASUS to read it doesn't work properly and even their own software/BIOS reports VID instead of Vcore. So VID reported by HWiNFO should match ASUS-reported Vcore. reported Vid by HWInfo is Vid, not vcore. I say that because at idle and full load, this Vid value reported by HWInfo doesn't change. Vcore should be a little bit higher than Vid at full load. This is why Vid reported by HWInfo is Vid, not Vcore....This is my opinion.